Not wanting to toot my horn–but if I don’t, who will?–there is a cluster of anniversaries to recognise as achievements in my life and work for animal rights. Not all souls sing; some growl—for justice, for truth, for nonviolence. 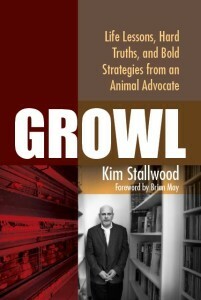 In this compelling book, Kim Stallwood offers frontline reflections with feet-on-the-ground theory, centered in compassion. Also, this month of June, I celebrate my consultancy work with Philip Lymbery, Chief Executive, Compassion In World Farming. Peter Roberts, CIWF’s co-founder, gave me my lucky break in animal rights in 1976 when he employed me as his campaigns organiser. I am forever grateful to Peter for this opportunity. This makes my work with Philip since 2009 particularly meaningful. CIWF is in the forefront of the campaign to end factory farming. Philip’s books, Farmageddon, and Dead Zone are highly recommended. 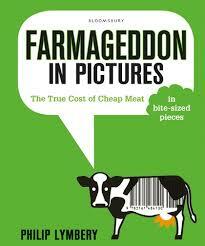 Check out the new Farmageddon in Pictures! Another project I want to recognise this month, although I must admit to it being on hiatus, is my first website, Grumpy Vegan. It was launched in 2006. You can follow me on Twitter as the Grumpy Vegan. Finally, on a personal note, it is 10 years ago this month that Gary and I left the US to return to the UK to live permanently. We moved back with our cat, Emmy, who sadly died two years later. We chose not to fly Emmy across the Atlantic. Instead, we travelled across in the Queen Mary. In fact, Emmy made us do it. I first visited the US in 1980. It has become my second home. Since 2015, I have been working as a consultant with Alley Cat Allies. President and founder, Becky Robinson, and I produced Alley Cat Allies’s 25th anniversary book, The Evolution of the Cat Revolution in 2015. 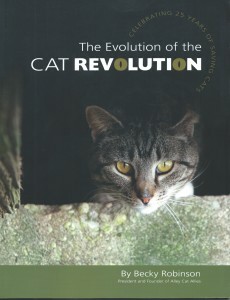 Currently, I work closely with Becky on researching and writing a second publication. Knowing what I know about animal cruelty and exploitation, I am thankful that it has been my luck in life to dedicate my time on this planet to animal rights. As much as I may complain about things, I would not want my life to be anything different.